Protect your ticker while enjoying a delicious meal! 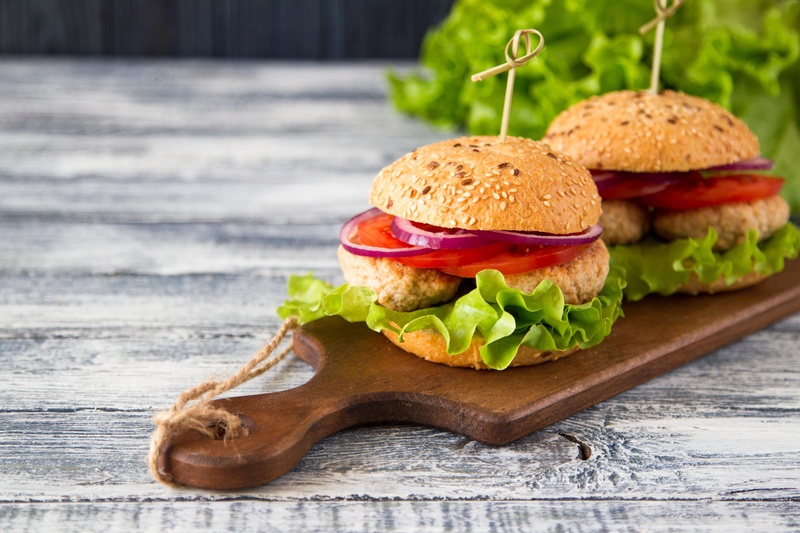 Packed with good-for-you spices, these turkey patties, topped with a sweet and crunchy apply and cabbage slaw are a healthful way to get your burger fix in, while staying on top of your health goals! In a large bowl, whisk together the lime juice, vinegar, honey and a pinch of salt and pepper. Add the cabbage, apple and jalapeño. Toss to coat. Let sit, tossing occasionally until ready to serve. Line a large rimmed baking sheet with foil and spread the potato chips in an even layer. Bake just until warm (this releases the oils and helps the spice stick) - about 5 minutes. Toss with paprika. Meanwhile, in a small bowl, whisk together the mayonnaise, sriracha and lemon juice. Set aside. In a large bowl, whisk together chili paste, soy sauce and ginger. Stir in onion and turkey to combine and mix. Form the mixture into four 3/4 inch-thick patties. Heat a grill or stove and drizzle olive oil into a large skillet to medium-high heat. Grill or cook the burgers until an instant-read thermometer registers 165 degrees, (7-8 minutes per each side on the grill, 4-5 minutes per each side on the skillet). Spread the buns with a touch of sriracha mayonnaise, then top with the burgers and slaw. Serve with the sweet potato chips and enjoy! *Recipe courtesy of the creative thinkers at Women's Day Magazine.